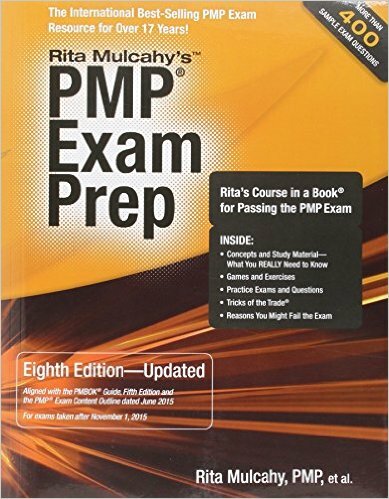 PMP Exam Prep does what it says it will on the cover. It will help you to pass the PMP® exam. When I was studying for my exam, I bought the seventh edition of this book. At that time, the seventh edition was the most current version of the book. PMI (the Project Management Institute) changes the PMP (Project Management Professional) exam slightly on a regular basis to keep it current and Rita Mulcahy’s PMP Exam Prep is updated regularly to reflect those changes. PMP Exam Prep is now in its eighth edition and is aligned with the changes to the PMP exam, which PMI is making in 2016. The book is well structured, following the nine knowledge areas that PMI uses. This makes it easy to make a connection between the content and the PMP exam requirements. PMP Exam Prep takes care to set the scene that PMI will expect you to have in mind while you are taking the exam. This is important. Taking the PMP exam while thinking about a small project involving five people, which is finished in 3 months, will cause you problems with the exam. PMP Exam Prep contains exercises in every chapter to help check that you have retained the knowledge presented. This gives the book a bit of a “school exercise book” character. But, if you do the exercises, it will provide a solid preparation for the exam. PMP Exam Prep is not the easiest read, but it is a huge improvement on trying to prepare for the exam using PMI’s PMBOK®. It is a major help if you are preparing for the PMP exam. If you are not preparing for the PMP exam, but are just looking for general information on project management, then there are other books available that are easier to read.